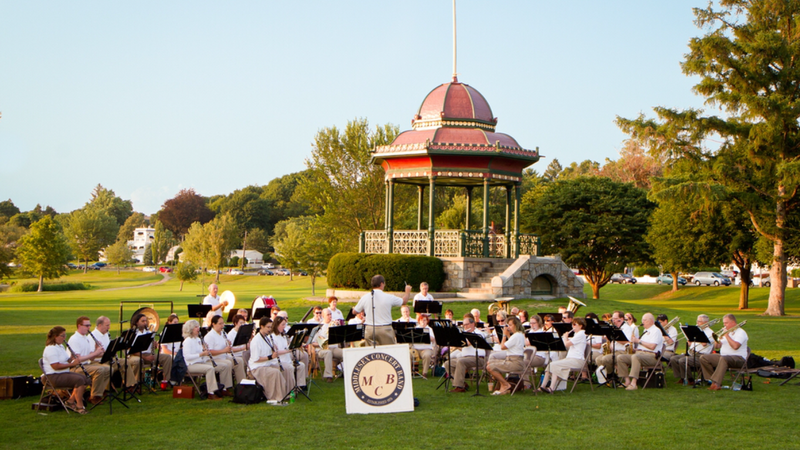 summer band concert on Thursday, July 14, 2016, at 7:00 p.m.
Wakefield, MA – The Middlesex Concert Band (MCB), a nonprofit community band based in Wakefield, will mark the end of their 2015–2016 season with a free concert on Wakefield Common on Thursday, July 14, 2016, from 7:00 p.m. to dusk, weather permitting. The concert will feature many audience favorites from the past season, so grab a lawn chair and head to the Common for an enjoyable evening of music. Music Director Mark Olson has put together a program that offers a wide range of music – from traditional concert band selections like John Williams’s “Liberty Fanfare” and “Cajun Folk Songs” by Frank Ticheli to popular favorites like the raucous “Pie in the Face Polka” by Henry Mancini and “Colonel Bogey,” the “whistling” march. The program will also feature several familiar songs from Broadway and Hollywood including a collection of Disney songs in “Disney at the Oscars,” a medley of marches from the “Star Wars” movies, the themes from “The Magnificent Seven” and “Pink Panther,” and much more. The Middlesex Concert Band is made up of more than 50 musicians of all ages who come from throughout Northeast Massachusetts and Southern New Hampshire. Originally founded in the 1950s as a marching band, the group evolved into a concert band in 1975 and has been performing continuously around the region since then. Don’t miss this free concert on Thursday, July 30, 2015 at the bandstand on Wakefield Common, starting at 7:00 p.m. For more information about the Middlesex Concert Band, including information about how to join the band, visit the group’s website at http://www.mcbconcertband.org.